Ultimately, it was the controversies surrounding my third book, Trailing Jesus which helped drive its modest sales, but none of it has consistently equaled the response to what some labeled my brazen inclusion in a list of like-minded philosophers of the historical Jesus a quote by world-class atheist, Ayn Rand. To which I often retort that if Jesus and Ayn had ever spent any time together in a locked room, neither could decide which of them was indeed God. And in my estimation after six years of research, beyond Friedrich Nietzsche, Rand’s first and lasting philosophical hero, only the icon of Christianity could equal Rand’s unyielding defense of the individual as moral arbiter of his/her fate. And just as the figure and scope of a Jesus can be all things to all people, thus is the author of The Fountainhead and Atlas Shrugged. Nearly thirty years after her death, Rand strikes a figure that can remarkably embody the basic tenets of anarchy while also espousing a strong sense of patriotic duty — a dedication to personal responsibility in the perpetuation of capitalist ideals. And once again, as the new century hits its second decade and the winds of change shift dramatically, the timing of author, Jennifer Burns’s biography, Goddess Of The Market — Ayn Rand And The American Right is almost eerie. “Objectivism, whether you agree with it or not, is part of the American intellectual experience,” Burns concludes. 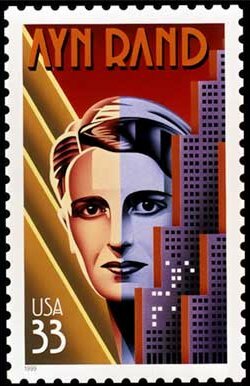 “Ayn Rand has had a profound impact on so many Americans, defining how they think about capitalism, markets, and the question of morality.” In the weirdest of evolutions, the idea of trusting the human intellect and its lust for greed and expanding the limits of true freedom has led to some of the most ignominious failures of this democracy, as has its subsequent remedy, an expanding government clampdown, whether Trust Busters, The New Deal or The Big Bank Bailout. It speaks ultimately of Rand’s fatal flaw — the fatal flaw in the human spirit, to be our own worst enemy and as Twain once coined, getting the government “of the people and by the people” we deserve.